Learn more about chronic wounds. 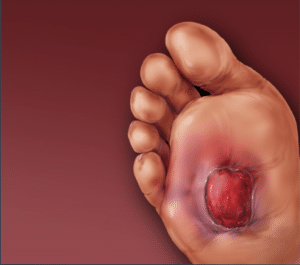 Chronic wounds have become a significant health crisis facing thousands of Americans. Any wound that does not heal normally can be considered a chronic wound, and increases the risk of a patient developing an infection that can lead to amputation and, in some cases, death. Who is most likely to suffer from a chronic wound? The short answer: anyone can suffer from a chronic wound. While conditions like circulatory problems, diabetes, obesity, and complications from surgery or radiation can greatly increase your risk of developing a non-healing wound, everyone is at risk of being wounded and developing a severe infection that doesn't heal. As we age, our skin becomes more delicate and less efficient at healing, making the threat of non-healing wounds more and more real. Even the healthiest, most active people can be debilitated by a chronic wound. Complications from Surgery: When a surgical wound comes apart, called a “dehiscence,” patients will likely develop a hard-to-heal wound. Pressure ulcers: Result from constant apresure on one area, and often develop in bedridden patients. Diabetic ulcers: Diabetic ulcers occur in 15 percent of diabetics. These wounds can quickly lead to amputation. Venous ulcers: Ulcers can also be caused by venous diseases. These wounds are very painful and cause inflammation and drainage. Arterial ulcers: Impaired circulation, diabetes, atherosclerotic disease, and other conditions can cause these ulcers.